The first week has passed since our helper D went back for her month-long break in the Philippines. Paradoxically it’s been a really good time for me to declutter the kitchen and my cupboards. It helps that I can do the cleaning at my own pace and reorganize the space according to what I want. Somehow I can’t quite do that with someone else around. I discovered that I quite enjoy decluttering. The second surprising discovery was that Salvation Army has a ginormous collection center for pre-loved goods. At first I was thinking of using Carousell to hawk some of my unused cookbooks but in the end I figured these things could go towards helping the Salvation Army to earn from the donated goods. The Tanglin center of the Salvation Army actually had a drive through drop-off, which is wonderfully convenient for me. They even have different carts categorized according to type e.g. Household items, books, toys, clothes and electronic goods. This was entirely up my OCD alley as I already decluttered my stuff according to type of item. The only problem I had was where the bag of DVDs fitted in – toys, books, household goods or in the electronics cart! Despite not having a helper it was not difficult continuing the usual meetings and dinners that we have at our place. The Instant Pot is a real helper; it is really a wonderful “pop it in the pot and walk away” device. So it’s easy to cook for 10-12 people. Beef stew on cauliflower mash, with salads and vegetables on the side was a hearty meal that I think no one went back feeling empty. 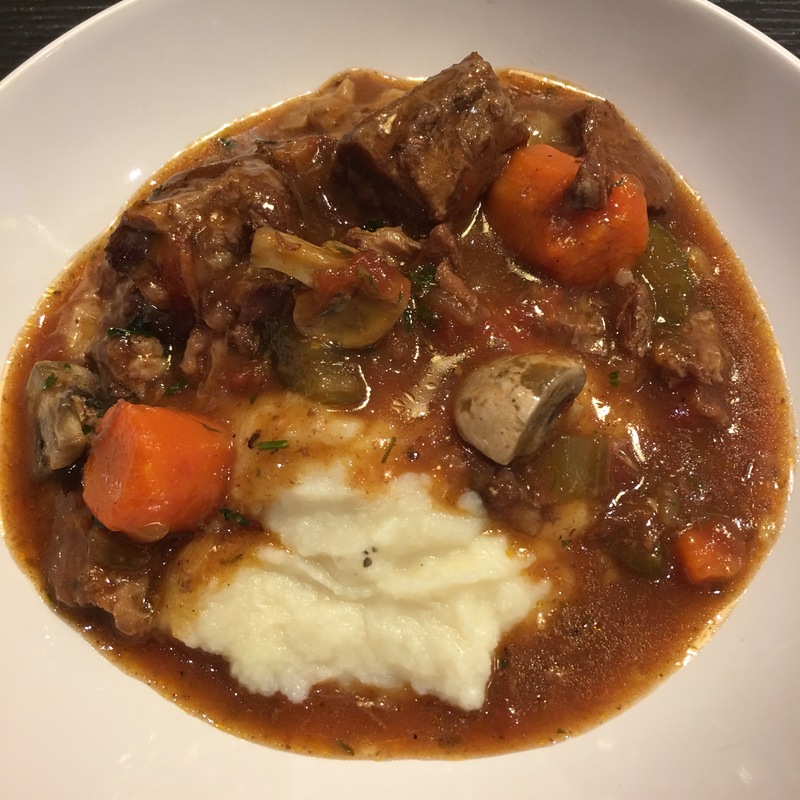 The dinner guests asked for the beef and mash recipe, which is why this recipe is up this week. Pour 1 cup of water into the Instant Pot and place the steamer basket over the water. Place half the cauliflower into the steamer basket. Seal the Instant Pot and put on manual high pressure for 5 minutes. When done, do a quick pressure release. Scoop the cooked cauliflower florets into a large bowl. Place the rest of the raw cauliflower florets into the Instant Pot and pressure cook as above. When done, put all the cauliflower into a bowl and add the butter, salt and pepper. With a hand blender, process the cauliflower. This will give a lovely whipped texture to the mash. Set aside. Clean the inner pot of the Instant Pot. Add the olive oil to the pot and turn on the sauté mode. When heated, sear the meat cubes till nicely browned on all sides, then remove and set aside. Sauté the carrots, onions and celery for about 5-6 minutes until slightly caramelized. Add the beef back to the pot, then pour in the balsamic vinegar and red wine, allowing the wine and vinegar to evaporate slightly. Mix in the diced tomatoes in their sauce, tomato paste, beef stock, salt, pepper and dried spices. Ensure that the meat is immersed in the liquids. Turn off the sauté mode. Seal the pot and use the “meat option” which pressure cooks for 35 minutes. Allow natural pressure release about 10-15 min. Remove the bay leaf from the pot. Skim off the oil layer at the top of the stew. Remove the beef pieces and place into a casserole pot. Put the pot on sauté mode. Reduce the liquid for about 15 min. Sprinkle the xanthan gum over the gravy. Stir through thoroughly as the gravy thickens up. Add the mushrooms and cook through about 5 minutes. Pour the gravy and mushrooms over the beef. Serve hot over the cauliflower mash.